As a certified nutrition educator from Bauman College, and a daughter to a breast cancer survivor, this book called out to me upon it's recent release. I can recommend it, whole heartidly, to women everywhere. You don't have to be a breast cancer survivor to learn valuable tips on how to nourish your body with whole foods. Bauman leads with a step by step approach to the book contents so that you can take a bite, a nibble, and a sip as you feast through the rich information sandwiched between the covers. While there are specific tips for the breast cancer survivor, many suggestions are applicable for all women who want to be healthy and live fully. In addition to all the wonderfully useful information that creates the bulk of this book, you receive the benefit of a cookbook, of sorts, with fabulous recipes and ideas in the back of the text. 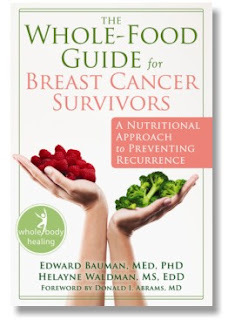 The Whole-Food Guide for Breast Cancer Survivors is a wonderful addition your home library. Click here to head over to the Bauman site, directly. Also available on Amazon here.